Newly elected officers and directors of Bowdoin College Fathers Association pose with Donovan D. Lancaster, Director of Bowdoin's Moulton Union and for many years Chairman of the College's Fathers Association Committee. 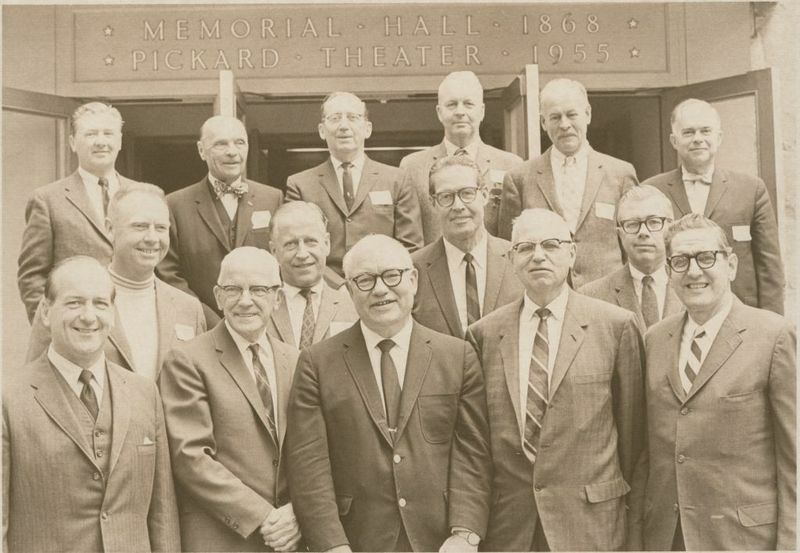 Front row, left to right: Thomas E. Delahanty, Herbert E. Mehlhorn, Donovan D. Lancaster, Edward E. Langbein, Peter W. Princi. Middle row, left to right: William B. Lever, Robert D. Collins, Charles F. Buckland, Robert P. Lampert. Rear row, left to right: Ronald V. Taylor, Eugene B. Martens, William J. Burke, Otis N. Minot, Leonard H. Dowse, Nathaniel Fensterstock.